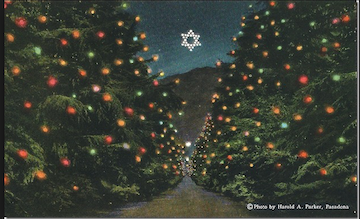 Perfectly aligned with Altadena's Christmas Tree Lane, built far above in the foothills, was a five pointed star built on a thirty-five foot tall wood scaffold, with seventy-five forty watt light bulbs. The star didn't float in the sky. This is an artist's rendering. But it did look like this. The star was built by F. B. Nightingale in the 1920s. Nightingale worked for General Electric.We were thrilled to find this 1939 letter written to the Altadena's Chamber of Commerce, from F. B. Nightingale describing the history of the "Star of Palawoo". In reply to your letter regarding the Christmas Star which we erect each Christmas sass. 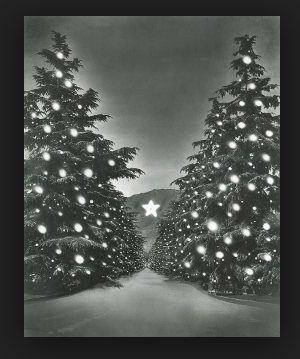 The star was first erected for Christmas 1926, It is 35 feet high and contains 75 forty watt lamps. It is located on the mountain directly above our home which is some 1400 fee above Colorado St. in Pasadena and five miles distant. A high wind destroyed the first star at the close of the Christmas season, , a second one was destroyed by the forest fire in 1935 but the third one is still in service & if we loose it there will be another one built. We originally called it "The Star of Palawoo" (Palawoo, and Indian word meaning the birds next -- the Nightingales home). Very little may be seen of the star by day as it is colored to match the shrubbery but at night it may be seen many miles distant, the star, gleaming out of the night is the only visible light in the great silent mountain space. F. B. Nightingale"The Magician of Light"
Read a detailed history about the Star of Palowoo at Bill Westphal's site. He has vintage photos of the star under construction.